When It Comes To Politics, States Are Barely United : It's All Politics In the last election, the red states got redder and the blue ones bluer. That's true not only in presidential voting, but at the state level, where half the legislative chambers are now dominated by supermajorities of one party or the other. The result is that blue and red states are moving further apart on most major issues, including tax policy, abortion and guns. Rather than a wave moving in one party's favor, crosscurrents have moved the states apart. One political scientist says, "This hardly ever happens, where the blue states get bluer and the red states redder, instead of the whole country going in one direction." States in this country are becoming like an unhappy couple. They've always had their differences, but their arguments have gotten so chronic that they're hardly talking to each other. Whether the topic is abortion, tax policy, marijuana or guns, Democratic "blue" states such as California and Illinois are bound to take a different tack than Republican "red" states such as Georgia and Kansas. "We're very likely to have legal gay marriage in most of the blue states and some of the purple states before the next presidential election," says Whit Ayres, a Republican consultant. "You'll never have gay marriage in Mississippi and Alabama unless a court happens to impose it." Ayres argues that states taking not just different, but opposite approaches to the most contentious issues of the day is a healthy expression of different attitudes and "an indicator of the genius of our federal system." Not all political observers are so sanguine. Having states moving rapidly apart from one another naturally makes finding consensus in the country far more difficult. People in California becoming convinced that those in Tennessee are "crazy" — and vice versa — has fed polarization not only within states but in Washington, where everyone is supposed to get together and work things out. 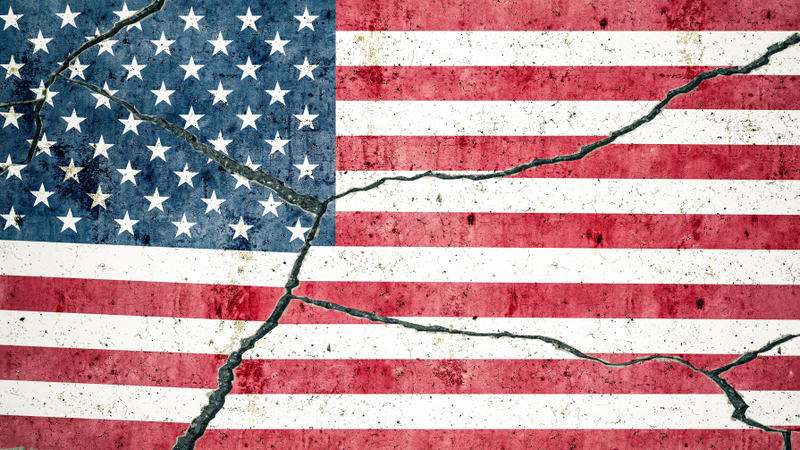 "We've seen polarization among [political] elites for quite some time," says Elizabeth Theiss-Morse, who chairs the political science department at the University of Nebraska. "It's gotten wider at the national level, and we're seeing it more and more at the state level." Last month, states voted mostly according to their usual patterns — only more so. At the presidential level, Barack Obama carried the exact set of states he won four years ago, excepting Indiana and North Carolina, which reverted to their usual habit of voting Republican. While Obama's margin of victory was less than it was in 2008, the number of states that were decided narrowly (by fewer than 5 percentage points) actually went down. "That means more states are voting heavily for one candidate or another," The Economist concludes. States may have gotten bluer or redder at the presidential level, but that was nothing compared with the deep partisan divides in voting for state offices. Only three state legislatures — Iowa, New Hampshire and Kentucky — are now divided, meaning both parties control one chamber each. That's the lowest number since 1928, although the picture has gotten a bit more complicated since the election, with bipartisan power-sharing arrangements in places such as New York and Washington state. In most states, not only does one party have control; it dominates. Fully half the legislative chambers in the country are now held by supermajorities. That makes compromise unnecessary — especially since the same party will hold the governorship as well as the legislature in all but a dozen states. Rather than a wave moving in one party's favor, crosscurrents have moved the states apart. "This hardly ever happens, where the blue states get bluer and the red states redder, instead of the whole country going in one direction," says Thad Kousser, a political scientist at the University of California, San Diego. It's the opposite of a collision course. With such contrasting political cultures, states are bound to move further and further away from one another when it comes to setting policy. This was evident almost immediately following the recent school shootings in Newtown, Conn. Even before the National Rifle Association issued its call to arm school personnel, legislators in red states such as Tennessee and Missouri had proposed legislation to require just that. In Democratic states such as California, however, there was talk of tightening restrictions on assault-style weapons and ammunition, with gun buyback programs hastily arranged at the local level. "It's magnified in the moment, but I expect red states will vote to expand gun rights and the blue states will seek to enact gun control legislation," says Scott Melzer, an expert on gun politics at Albion College in Michigan. It's the same on issue after issue, whether it's government-funded health care, climate change or teaching evolution. That necessarily moves people further from the notion of compromise, says Bill Bishop, editor of The Daily Yonder, which covers rural issues. "There are fewer of those crosscutting issues where you're enemies one day and friends the next," he says. "It will further reinforce the movement of people to get in their tribes." Bishop wrote about the increasing tendency of Americans to live among people who think politically like themselves in his book The Big Sort. In 1976, he says, just over a quarter of all Americans lived in what he called landslide counties, which either of the presidential candidates carried by margins of at least 20 percent. Now, more than half reside in landslide counties. There are plenty of Republicans living in every blue state, of course, and the same is true about Democrats living in states dominated by the GOP. But increasingly, states are voting entirely one way or the other. If you look at the map of state control, it looks an awful lot like the presidential map, with only a few exceptions — notably GOP control of a few Obama-supporting states such as Virginia, Florida and parts of the Upper Midwest. Ayres, the Republican consultant, says that's just fine. Alabama's political culture is a lot different from Oregon's, so it's "perfectly reasonable" for public policy in those states to represent differing attitudes. With Washington so mired in argument, it might not be entirely a bad thing for states to address marijuana regulation and health care differently, says Lara Brown, a political scientist at Villanova University. "Maybe the most productive way out of this current polarization is to stop making it an 'either or' and start making it a 'both' kind of reality," she says. "All our people's diversity of beliefs may end up better expressed and realized." That's putting things in a positive light. But constant disagreement about how to tackle issues may instead make it harder to forge agreement on a national level, suggests Theiss-Morse, the Nebraska professor. Voters in different states seem increasingly convinced that people who live elsewhere and think differently are not just wrong, but unreasonable. "What we increasingly see in politics and government is that it's a zero-sum game — that one side wins and the other side loses," Theiss-Morse says. "It's this view that if the other side gets anything, then we've lost."